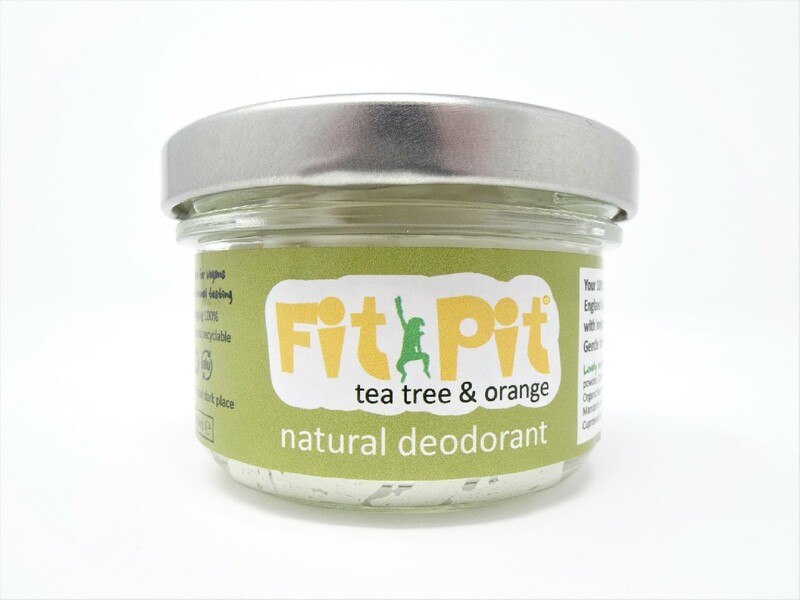 Scented with invigorating tea tree and orange essential oils, this deodorant has a low bicarb formula that is light and gentle & suitable for delicate skin. The Bicarbonate of Soda subtly alters your skins natural pH which prevents smell-causing bacteria from thriving, so this cream doesn’t merely mask bad smell, it prevents it. The Coconut oil and Shea Butter moisturise your skin. The 100% organic formulation also doesn't block sweat glands which means the body can freely remove toxins, making it healthier all round. This 100ml jar contains a 3-month supply. The jar can be returned to Fit Pit for reuse afterwards (and a small cash incentive to cover postage). Please see Packaging Afterlife to find out how. Suitable for vegans and for use during pregnancy or the menopause. Packaging: Glass jar and metal lid. Ingredients: Organic Maranta arundinacea root (Arrowroot) powder, Organic Cocosnucifera (Coconut) oil, Sodium bicarbonate, Organic Butyrospermum parkii (Sheabutter), Citrus nobilis (Organic Mandarin orange) peel oil, Melaleuca alternifolia(Organic Tea tree) oil, Cupressus sempervirens (Organic Cypress) oil. Contains no parabens, BPAs or Aluminium Salts. Fit Pit comes to you in a glass jar with a metal lid. If you have a use for the jar after you’ve finished, then use it! Otherwise both the jar and the lid are 100% recyclable in most parts of the country (check here). But before you put it in the recycling, please consider returning the jar to us so we can pass it on to the manufacturer. The lovely team that produces these fantastic deodorants are keen to work in a circular way and are really happy to receive old jars back so that they can be re-used. You can save up jars over months, or even years & then send them back in one package (email us for the address). 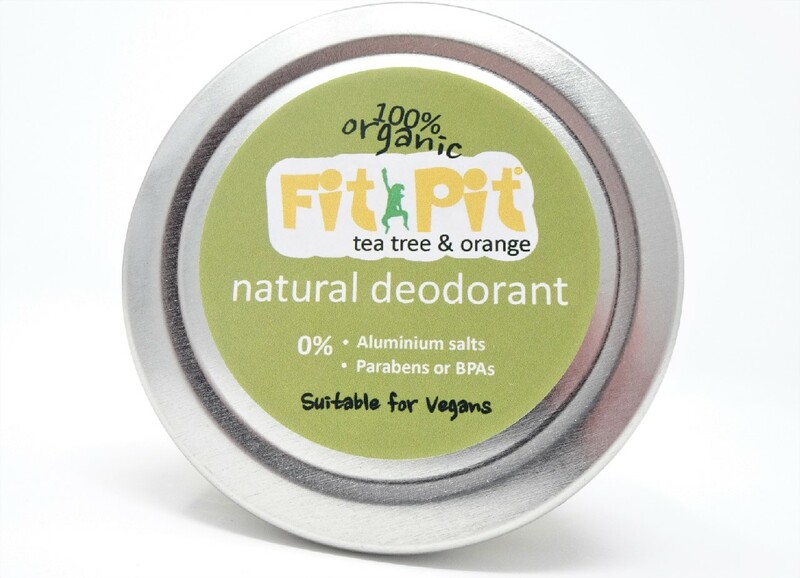 Fit Pit will give 30p for every 100ml jar returned. We're hoping to find a way to make returning these glass jars easier- whether that's through a network of collection points, or pick-ups - if you have any suggestions for how this could work, feel free to drop us an email. Apply a pea size amount of this cream deodorant to underarms with fingertips in the morning or after bathing. Melts on contact with warm skin. No waiting to dry. No white stains. Please store in a cool dark place to keep Fit Pit at its best. In periods of very hot weather Fit Pit can be placed in the fridge - allow to soften slightly at room temp before use.